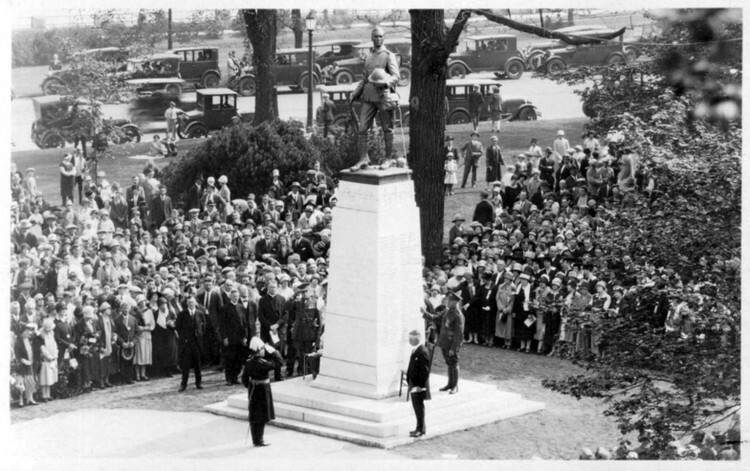 above: a view of some of the names inscribed on the Clifton Hill War Memorial cenotaph. 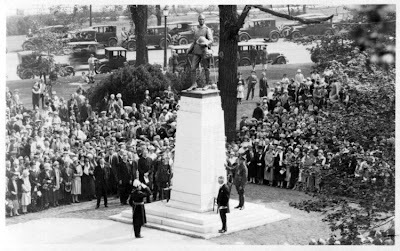 below: On May 22, 1927, the Clifton Hill Great War Memorial was officially unveiled. 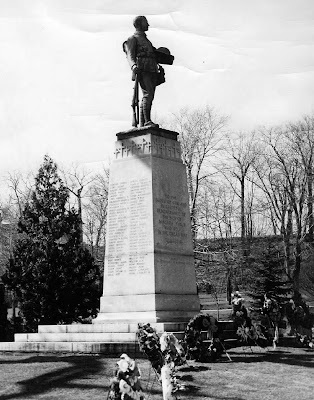 It was - and still is - located on the south side of Clifton Hill, between Falls Ave. and River Rd., in Queen Victoria Park, Niagara Falls, Ont. This view looks in a south-easterly direction towards the memorial; River Rd. is seen running in the rear, where the cars are parked; behind the cars is the right-of-way where the tracks of the Great Gorge streetcar route still ran at the time; and beyond the tracks can be seen the still-familiar iron rail/stone block fence guarding the top of the Niagara River gorge. 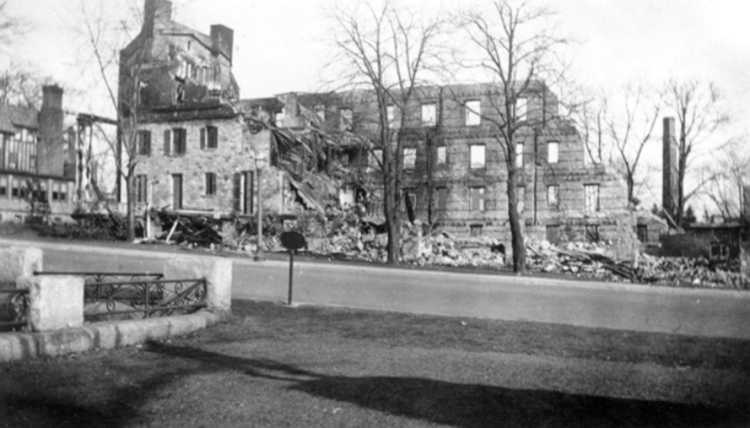 This photo was most likely taken from an upper floor of the second Clifton House hotel, which was directly across the street from the monument at the time. The old Clifton Incline, which took passengers down to the river's edge to board the Maid of the Mist boats, would have been just out of frame, to the far left, at the foot of Clifton Hill. above: the same view in Nov.2010, this time from the lower vantage point of Oakes Garden. Now the Maid of the Mist elevators are seen in the far right distance; and a bus shelter is in the left distance. The streetcars are long gone. 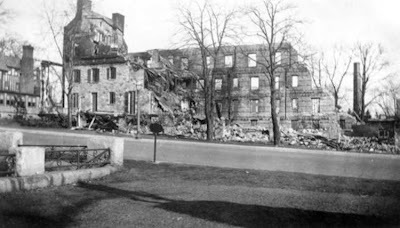 above: wreaths line the base of the Clifton Hill War Memorial after the Remembrance Day ceremony of Nov.11, 2009.
below: This photo from Jan.1933, shows the ruins of the Clifton House hotel after a fire destroyed it on Dec.31, 1932. The photo is looking northward, across Clifton Hill, which is seen in the foreground. At the far left is seen a part of the east-side of the Foxhead hotel. Note at the bottom-left is seen the familiar stone fencing seen around Queen Victoria Park, and also note the shadow on the ground: it is the shadow cast by the soldiers' statue and monument. Some five-and-a-half years earlier, the photo at the top of this post had been taken from one of those windows across the street. above: same view, Nov.2009 - the same stone fence is still there; while across the street Oakes Garden was built where the Clifton House had stood. Note the crest of the hill in the distance, before the Fallsway/Quality Inn hotels were built in the 1950's (see here). The top of the hill is where the Clifton Place mansion had stood from 1857 to 1937, so for about ten years the mansion was in view from the memorial. above: same view, on a sunny spring day in Apr.2010, with bright yellow daffodils emerging at its base, the cenotaph stands as it has since 1927, with yet more names from the Korean war now added. On the hill, the Quality Inn buildings have come and gone; now being replaced by a new mini-putt attraction. The long blank wall seen behind the trees at the far upper right is the east-side wall of an amusement complex facing onto Clifton Hill. The photo above belongs to R. Bobak, and does not belong to any HOCO employees or their websites. McGuinty: the No-Plan Flip-Flop Man!